It is late Spring 2018, the vines have just started to flower, it was a very dry winter. Spring weather has been fickle so far with recent glimpses of the Summer to come, today though we have a firm southerly change and it’s frigid outside. I’m amazed when I look back to when we planted, it’s been almost 20 years. There have been lots of challenges along the way, in 2002 a grassfire burnt most of the young vines despite this set back they grew back then in 2006 several nasty frosts occurred. giving kind words of encouragement. We have a special section from which I have been harvesting separately and producing the Blue Label Single Barrel Shiraz, the first release is all but sold out but do not despair a new vintage is due early in the new year. The kangaroos have been a real pest for several years now they have developed an insatiable appetite for the grapes so before too long the fencing surrounding will be increased in height. We harvest about 3 to 4 tonnes of lovely Shiraz each year even with complete bird netting the kangaroos still eat about 1 tonne! The 2014 Reserve Massif Shiraz is almost sold out in the next few weeks the 2016 will be prepared for bottling, the revamped Massif label looks very attractive but I wasn’t completely satisfied with the paper stock and base colour so there will be some further changes. The line up of Shiraz at cellar door in addition to Reserve Massif also include the Clayfield Moyston ‘Ton Up’ Shiraz 2013 and 2012 Clayfield Grampians ‘Black Label’ Shiraz, Clayfield Thomas Wills Shiraz 2012 and are all elegant wines. The 2012 Black Label Grampians Shiraz is a stunner, it has been selling well and with it’s current maturation the wine has developed beautifully. Visitors to our winery are usually greated by Ernie (Jack Russell X) now 8 years old, Ernie is now accompanied by Ruby our adorable Weimaraner, she is almost 6 years old don’t be frightened if she comes to great you she loves a pat and sits on command easily. Ernie is tennis ball crazy but please refrain from throwing the ball as it will cause his leg to become sore. To date the weather has been favourable for the vines we didn’t experience frost so we got off to a good start we expect to harvest as normal during late March, our potential crop is looking fair so keeping our fingers crossed and hoping for another quality harvest. Enjoy your visit to the Grampians we would surely welcome you to visit us and purchase our lovely Shiraz. Welcome to Clayfield Wines online, the revised website adds a fresher appearance and presents our wines in an attractive contemporary format. 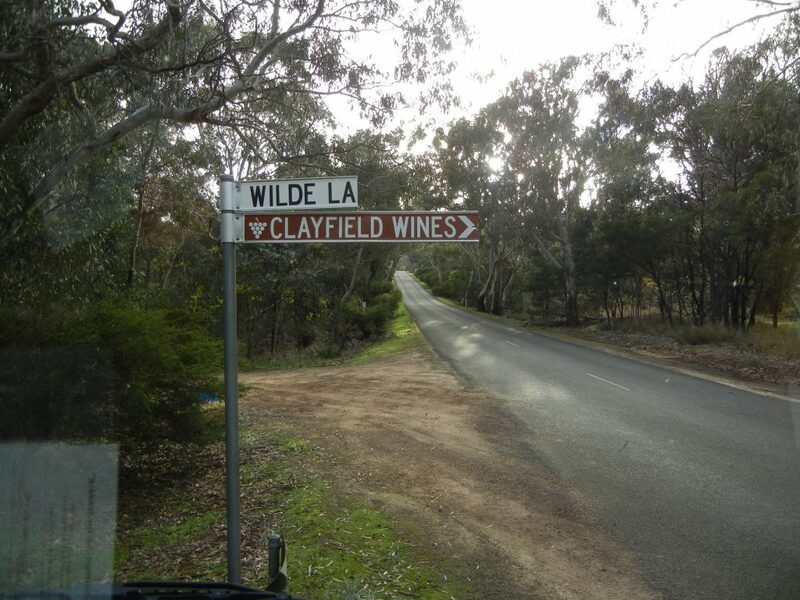 Clayfield Wines was established in 1999, my goal was to produce premium Grampians Shiraz in limited quantities showcasing the elegant flavours and subtle differences from vineyards within the Grampians region. The first few vintages were produced from Shiraz supplied by several local growers and 2002 our own vines contributed a small amount to the wine. The 2002 turned out to be one of our famous Shiraz wines earning a Gold medal award at the Melbourne Wine Show. In 2006 the Clayfield Grampians Shiraz 2004 earned 5 stars in Winestate Magazine World’s Greatest Shiraz Challenge, being selected in the Judges Top Ten. This classic Shiraz also earned a top Gold Award at the Visy Australian Greatest Shiraz Challenge and was runner up overall. The 2010 Clayfield Grampians Shiraz vintage was also reviewed highly and we were invited by Winestate Magazine to showcase our Shiraz at the Hong Kong International Wine and Spirit Fair in 2013. The newest wine label in our range is the Clayfield ‘Ton Up’ Moyston Shiraz 2010 which is 100% Shiraz from our own vineyard. The Ton Up Shiraz received Gold awards and trophies for Best Regional Shiraz and Best Regional Red Wine at the Ballarat Wine Show in 2012. Currently it is late Spring 2018, the vines are growing well and flowering has just begun. The number of bunches indicate that the 2019 yield should be good, the winter was very dry we must use the water we have sparingly for irrigation. The front block has been cultivated and sown to forage Brassica the roots of this will open the soil encouraging water to penetrate and air for soil micro-organisms to thrive. Clayfield Moyston Vineyard is totally organic, it is my belief that this practice produces better grapes and healthier wine. Cellar door opening hours are Monday to Saturday 9 am to 5 pm, Sunday 11 am to 4 pm. Closed Christmas Day. Our apologies in advance should you arrive and find we are closed, it is inevitable that sometimes we are absent.